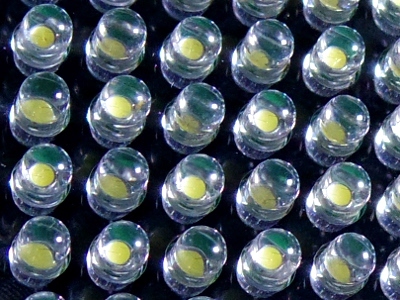 Light bulbs with embedded microchips could provide people with WiFi connectivity, say researchers. A team from the Shanghai Institute of Technical Physics of the Chinese Academy of Sciences says LEDs, rather than 2.4GHz routers, could perform data transfers in the future and would be cheaper and more ubiquitous. Whereas wireless flash triggers are moving in the opposite direction — from light-based signals to radio ones, for better range and stability — it is speculated that optical signals would be more secure than conventional WiFi technology. Blocking the light blocks the signal, which is not necessarily a drawback: while a photographer might need a flash to trigger from behind a tree, office workers may not want passers-by accessing their network from the street. Unlike WiFi signals, light does not pass through walls. The term “LiFi” was coined two years ago by the University of Edinburgh’s Professor Harald Haas, who showed that an LED fitted with a signal processor could — by flickering imperceptibly to the human eye — transmit information, such as HD video, to a computer. “Everywhere in a day there is light. Look around. Everywhere. Look at your smart phone. It has a flashlight, an LED flashlight. 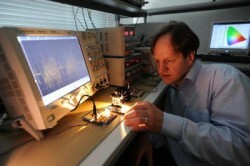 These are potential sources for high-speed data transmission,” said Prof Haas in 2011. He helped found the firm pureVLC, which last month announced that LiFi could also work with reflected light and so may not depend entirely on line of sight. According to the Chinese scientists, a single one-watt LED would be enough to provide data to four nearby computers at rates “as fast as 150 megabits per second”. However they said it would be a while before the technology could reach the mass market. Sample “LiFi” kits will go on display at the China International Industry Fair on 5th November in Shanghai. With cameras widely adopting WiFi and cameraphones able to access the internet, tomorrow maybe your lights will be able to do so too. What do you think?